Now it’s the Christmas time of year again! No matter what situation you’re in and what’s going on in your life, just take some most likely well-deserved time off now and just relax and embrace the holiday spirit! Now I’m going to have time off until January 9th unless something goes fundamentally wrong. I really look forward to just spending time with the family, relaxing and taking control over my life again. No computers, just quality time. A very Merry Christmas to all of you and Happy New Year! PS. I will write one more post this year, probably around the day before New Year’s Eve, summing up 2005 and what it meant to me. DS. PS 2. Make me real happy and write how to say Merry Christmas in your language (and what language it is :-))! DS. Merry christmas to you and your family, my friend! Yeah, merry christmas to you too, Robert! We celebrate Orthodox Christmas 7 January, but russian like holidays and we celebrate also and Catholic one and Chanukah and so on. I do hope that you and your family have a truly wonderful festive season and a happy and successful new year. 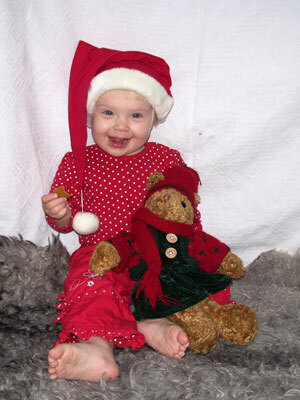 I said "Merry Christmas to Emilia, Fredrika et Robert! A 4-meter Christmas tree… wow that's real business! Merry Chrismas to all the people who will read this message!" Have a merry Chrismas and a lovely holiday season! I just learned "Mele Kalikimaka" is said in Hawaii yesterday. I used to like listening "Feliz Navidad", a good song saying "Merry Christmas" in Spanish and English, on radio while I was in California. That was so peaceful. Anyway..
Merry Christmas, Robert, enjoy the holiday and especially the time with your family. Happy New Year: Ein frohes neues Jahr! Actually, I'm a little confused … am I the only German-speaking reader of your blog? Can't imagine that. A Merry Christmas to you and your family. First Christmas for my newborn son, so I am understanding your excitement. Post a picture of your giant tree, as we have a small apartment and only a tiny tree. 4 metres!!! Ours is nice but only about 2 metres. Strange, that Quinn's message appears only as a series of blocks in Opera 9TP. It's in Japanese. It probably does something with your machine not having any Japanese fonts. I checked with Opera8.5 on MacOSX and it was fine. Nessa terra distante e fria em que vocÃƒÂª mora, descobri que hÃƒÂ¡ muita bondade e calor humano. Obrigado por tudo e felicidades! For all the people visiting this site I wish a Merry Christmas and a Peacefull 2006. Godjul! Hoppas det nya ÃƒÂ¥ret blir fint! HyvÃƒÂ¤ÃƒÂ¤ Joulua from your eastern neighbor Finland. Yes, a bit late I know but I was staying away from my computer for the holidays. Very refreshing. God Jul och god fortsÃƒÂ¤ttning. I hope you'll get a well deserved rest, from yeah you know what I mean.